Sweets really aren’t my thing any more – I moved from sweets to chocolate a long time ago. So CT was a little surprised when I accepted some for review. What have love hearts got to do with chocolate? He asked. Well what a question. Love is in the air and so is nostalgia. These take me right back to my childhood days, when every self-respecting girl would while away her time dreaming over a packet of love hearts. And wouldn’t these make great decorations for a Valentine’s treat? I was hoping they would arrive in time to top the Valentine’s Hearts I made last week, but sadly they were just a little bit too late. They may well be featuring, however, in a special Valentine’s post on the day itself. Did you know that Pope Gelasius declared February 14 St. Valentine’s Day around 498 AD? Another reason for accepting was that I just could not resist this limited edition, Valentine’s special, heart shaped tin, filled with mini love hearts. I love tins, they are so useful for putting all those little bits and pieces in. And, it has to be said, I am rather in love with the colour red. A unique sweet scent that is almost floral seduced my nostrils. I put the first love heart I’d had in many a long year “Try Me” into my mouth and I was straight back to the bittersweet memories of youth. I never did have the guts to offer an “I Love You” or any other love heart for that matter, to the boy of the moment and I sadly never received one either – not until I was an adult anyway! I couldn’t remember what love hearts tasted of, so I was a little taken aback initially at the sharp fizz of sherbet. I remembered that white ones were my favourite, but wasn’t sure if each colour actually had a different flavour. But oh yes they did, fizzy fruity flavours: orange, cherry, blackcurrant, lime. I found the white ones were the sweetest but couldn’t pick up a discernible flavour. I also found there was a reason I used to like Love Hearts. Take them away, or I might get addicted!!! Swizzles Matlow, the company behind Love Hearts has been in operation for over eighty years. It made many of the sweets I was familiar with as a child: parma violets, refreshers, drumsticks – oh what fun I had trying to decide what I would spend my pennies on. It still makes those same ones now, rather worryingly termed Retro Sweets. As well as giant fourpacks retailing at £1.09, the Valentine’s collection also includes giant tubes (£1) and the aforementioned tins retail at £1.99. With only 100,000 made, you’d better get in quick. 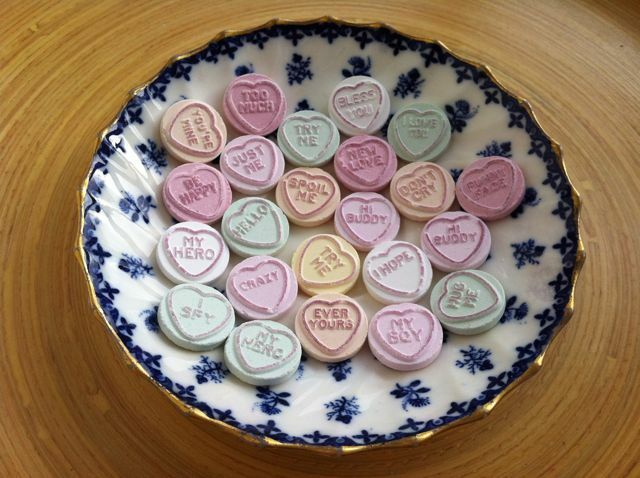 I think love hearts are my favourite sweets… I love any thing sherbetty really, so these are a retro winner for me! Exactly Laura – brilliant tin and cupcake decorations. Glad it’s not just me! I think love hearts remind everyone of their childhood! The tin looks really sweet, I picked up some of the mini love hearts (sadly in bags!) for Valentine’s Day baking. Well you’re one step ahead of me Hannah. It wouldn’t have occurred to me to use love hearts if I hadn’t been sent some. It might from now on though! I do love love hearts, and as well as cupcake toppings they made super tiles on my Velentine’s gingerbread house. I’m very tempted to pop along to Sainsbury’s and buy a tin in the morning! What lovely sweets to review. Oh Jude, yes I remember your tiles now and how effective they were. Hope you get lucky with a tin. I love love hearts!!! I’ve actually made some love heart cookies this week!! You can also get them now online with personalised messages…my friend had some as her wedding favours!! Oh lovely Laura, look forward to seeing your cookies. And yes, personalised ones, would make excellent wedding favours. I remember Love Hearts! I can’t remember what they taste of, but I do remember swapping them in the school playground! Karen, I couldn’t remember either, until I tasted one – a weird sensation! Oh I LOVE love hearts I wish I could do this! I am now on the hunt for the tine – hinting loudly at my hubby – not sure he will get the hint though! That’s interesting – I always remember them being rather chalky and tasteless, but the way you describe them makes them sound like refreshers…I think I need to revisit! Plus, I would buy them just for that lovely heart shaped tin!